This post brought to you by Boar’s Head Brand®. All opinions are 100% mine. A few weeks ago I was contacted by Boar’s Head(R) to see if I wanted to compete in their Boar’s Head® Boldest Bracket Challenge. The idea is simple enough. Take 16 awesome food blogs and let each one come up with an original sandwich using the Bold line of Boar’s Head(R) products. Smash those sandwiches together in a March Madness style bracket and see who comes out on top! Well, this behemoth of a Chipotle Club Sandwich is my entry and I think I have a good shot at taking the prize (bragging rights). But guess what? Even though I can’t win actual prizes, you can! All you have to go vote for your favorite sandwich and you can win some serious prizes. The further the sandwich makes it that you vote for, the better the prizes get! The grand prize is a freakin’ iPAD Air, people. While you can start voting today, my sandwich showdown is on Thursday (03/06)! 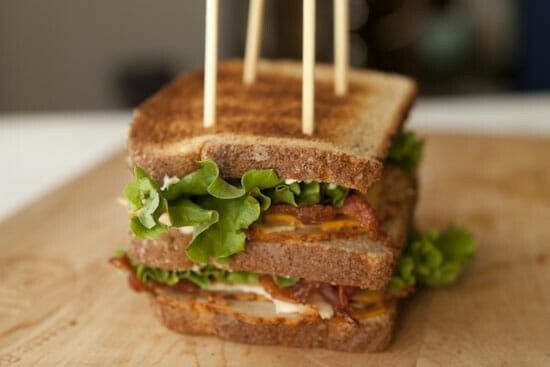 This huge club sandwich spiked with three different chipotle ingredients from Boar’s Head Brand! 2. 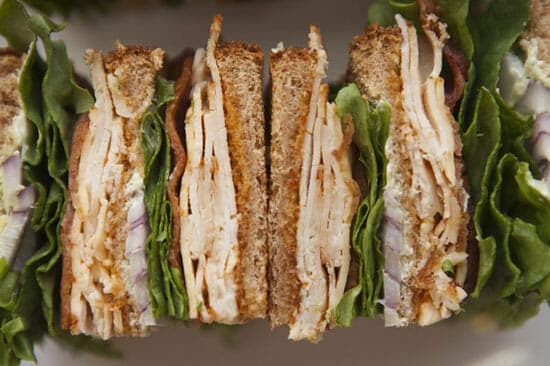 Spread 1 tablespoon of Fiery Chipotle Gourmaise on one slice of bread and top with 2 slices of Chipotle Chicken Breast, 1 slice of Chipotle Gouda, two strips of bacon, 1 leaf lettuce and two slices red onion. 3. In a small bowl, mash together avocado and Greek yogurt and season with a pinch of salt. 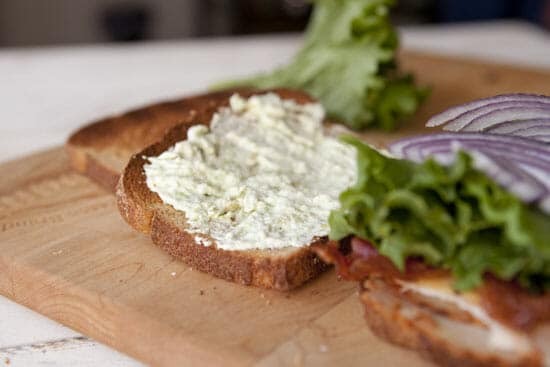 Slather second piece of bread with half of avocado yogurt dressing. Place second piece of bread, avocado side down, on the sandwich. 4. Spread another tablespoon of Fiery Chipotle Gourmaise onto the top of second piece of bread. 5. 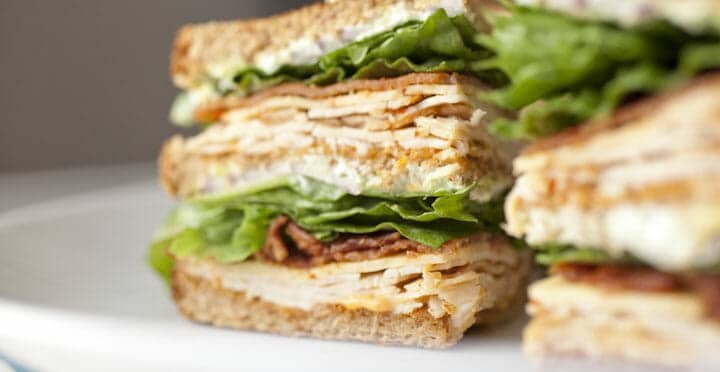 Repeat layering products on top of bread slice in the following order: 2 slices of Chipotle Chicken Breast, 1 slice of Chipotle Gouda, two strips of bacon, 1 leaf lettuce, two slices red onion and remaining avocado yogurt dressing. 6. Crown sandwich with remaining bread slice, secure each quarter of sandwich with large toothpicks or skewers, and slice sandwich into quarters. Serve immediately. The traditional club sandwich is taken to another level with all the chipotle flavors I added to this guy, but one thing stays the same. 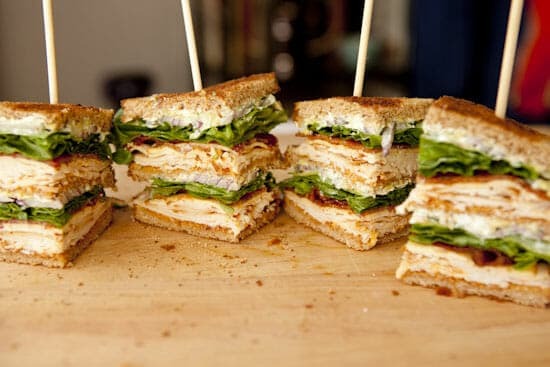 It’s not a club sandwich if it doesn’t have super-crispy bacon. 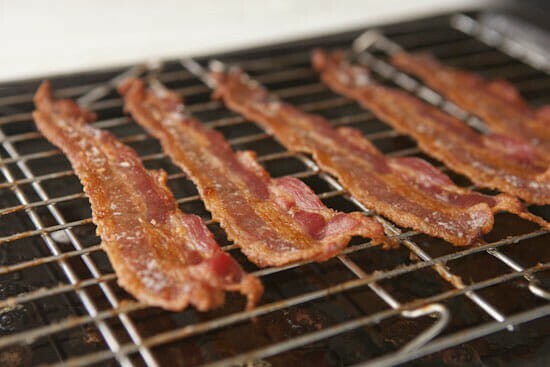 To get mine crispy, I like to bake it on a wire rack at 350 degrees F. for 15-20 minutes. 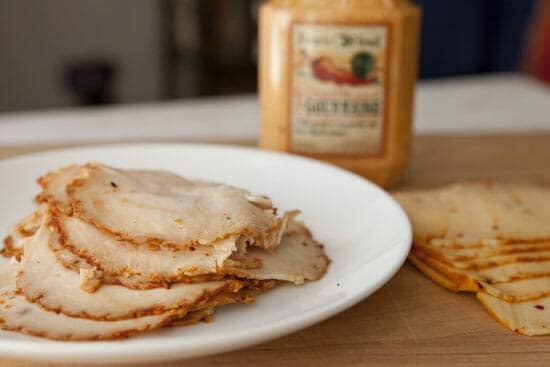 Boar’s Head(R) has three awesome products that are all laced with chipotle flavors: a roast chicken breast, a gouda cheese, and a Gourmaise sauce (think mayonnaise, but spicy)! I used them all. Making this delicious beast is pretty straightforward. Toast your bread and smear a piece of toast with the Gourmaise sauce. 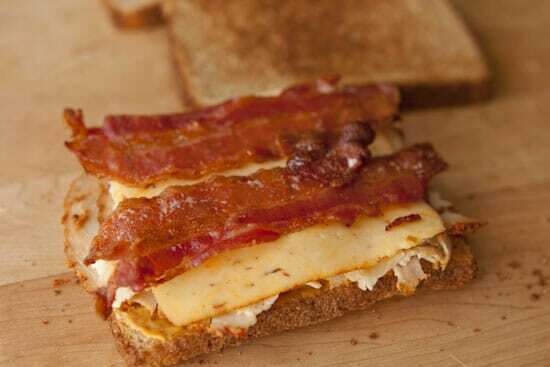 Then layer on a few slices of chicken, a slice of gouda, and some crispy bacon. Top that with some crispy lettuce and red onions. On the second piece of bread, smear on the avocado spread. It’s just avocado and yogurt mixed together with some salt and lime. It calms some of the chipotle heat! Put this sauce side down on top of the lettuce and onion. Then you just repeat the whole building process on the top layer! You’ll need some skewers to hold all the layers of the Chipotle Club Sandwich in place. Cut it up and serve it up! This Chipotle Club Sandwich is a big sandwich for one person, but you could set out the quarters and people could help themselves. I tried to get a good photo of all the lovely layers! I’ll be honest, I ate this entire Chipotle Club Sandwich all by myself. It was spicy, but the avocado sauce and veggies help keep the heat in check. A cold beer wouldn’t hurt either. Be sure to zip on over to the Boar’s Head® Boldest Bracket Challenge and vote for your favorite sandwich (hopefully mine)!